When we visited The Lane Vineyard only a month ago, the open area beneath their tasting room was just a rustic carpark of packed earth. It has since been transformed into an elegant outdoor entertaining terrace, designed to allow winery visitors the opportunity to enjoy the idyllic vineyard in a relaxed alfresco style. On our arrival at the venue the terrace was relatively unembellished; a smooth and spacious expanse of dappled concrete encircled by curved boarders, broad steps and a lush lawn. The true magic of the space took shape as other guests began arriving and their glasses filled the air with the tinkling clinks of celebration and enjoyment. The openness of the area allows the sweeping vistas of the Adelaide Hills to merge seamlessly into the edges of the party and wireless Bose speakers sent the DJs tunes flowing into the evening air. 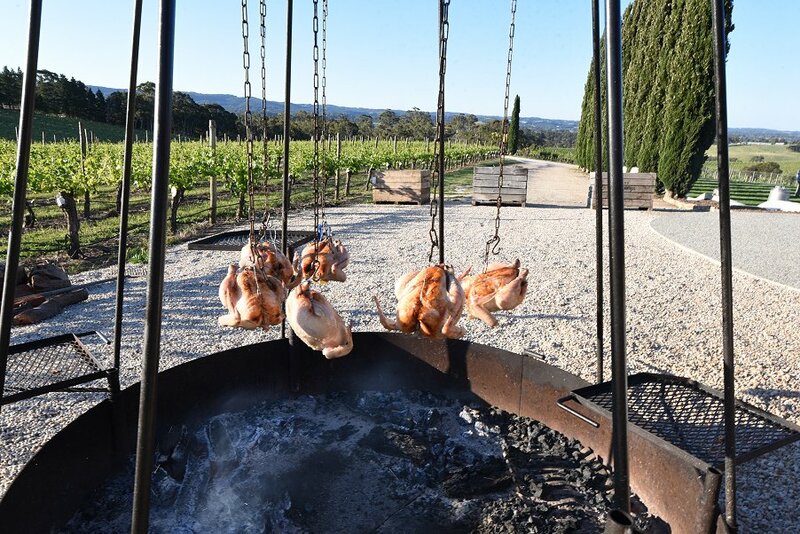 A steady stream of gourmet canapes made their way from the kitchen to eager mouths and for those who felt like a something a little more substantial, the Lane’s chefs had brined chickens for 48 hours before suspending them to slow roast over an open fire. The terrace has been completed just in time to allow us to toast to The Lane’s most recent triumph with their newly released Penny rosé. 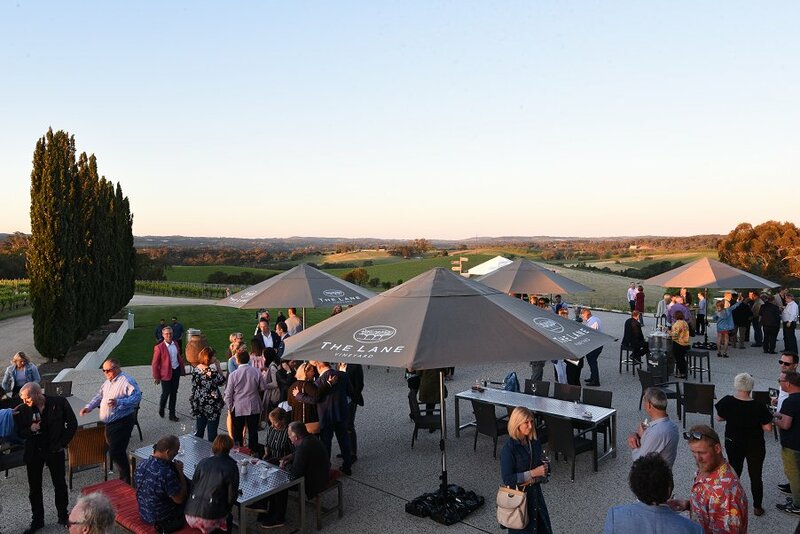 Against notable contenders such as d’Arenberg and Penfolds, The Lane Vineyard has won the Best of Tourism Wine from Great Wine Capitals Awards 2019. The award recognises their elegant wines, Executive Chef James Brinklow’s multi-awarded kitchen and their variety of innovative gastronomic experience packages. Stepbrothers Martyn Edwards and Ben Tolstoshev, General Managers of The Lane, hope that the laidback atmosphere of the outdoor area will now allow them to extend their hospitality to families and larger groups. The terrace offers a relaxed tapas and charcuterie menu during tasting room hours and is also available for private events of 50 people or more. The upcoming long summer days are a perfect time to wind your way up into the Adelaide Hills to settle in a for languid afternoon surrounded by spectacular views. The terrace and tasting room are open 10am – 4pm daily and you can visit The Lane’s website for information on the many experience packages available.